What I Like to Add to My Salad in a Jar is a collection of ideas for ingredients you can carry in your lunch bag to dress up plain lettuce salads, specifically, non-perishable foods for people without access to refrigeration. Wondering what I put on all the salads I pack in a jar? (salad-in-a-jar) I like variety but convenience, calories and healthiness are bigger concerns. Add the fact we only have a dorm-size personal refrigerator at my work for about 8-10 employees. So non-perishable and easy-to-carry in my lunch bag are also vital. Let’s look at the dressing issue first. I can’t store a lot of bottles of salad dressing in that tiny refrigerator so I have devised a better system. In the past, I used small (2-3 oz) plastic containers to make individual servings. But they were hard to keep up with in the dishwasher and my “plastics” drawer. Does anyone else have problems with missing lids, or unmatched sets? 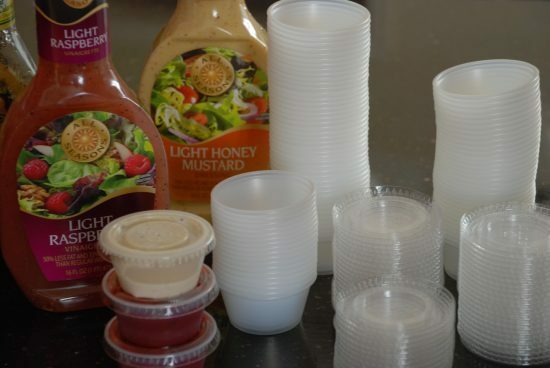 I found the solution at the restaurant supply store–small, inexpensive individual plastic cups with lids like restaurants use. Can’t beat them for convenience. Toss when done. I like the small size for two reasons: portion control and easy-to-carry in my lunch bag. Make up plenty and store in the butter compartment of the refrigerator. It’s not a good place to store butter because butter needs the coldest spot in the fridge. Regarding the dressing itself, I prefer homemade. But time constraints and laziness more often prevail. I look for something at or below 80 calories per serving. For a quart jar of lettuce, I need about 2-3 oz. depending on the viscosity of the dressing. Until I come up with something more original (which I will post here when I get to it) my favorite today is the Honey Mustard Great Seasons Brand from Walmart, (I have done extensive research on diet Honey Mustard Dressing and this has been declared the winner.) I also like Ken’s Raspberry Pecan and most any of the diet balsamic vinaigrette dressings. Beware of the extremely low calorie dressings. I think they taste like flavored water but suit yourself. I’m not willing to eat crummy food in the name of saving calories. Keep add-ons simple. If I ate lunch at home with a large refrigerator at hand, I would be much more creative. For now, I like to mix toasted almonds (see note at the end) with smoked sundried tomatoes (found at Krogers and much tastier than plain sundried tomatoes) or dried cranberries, blueberries or other dried fruit. Bags of these combinations will keep for weeks in your desk drawer. Sprinkle ¼ to 1/3 cup of Fiber One in place of croutons. It may seem weird at first but it really is good and adds lots of crunch and fiber. It’s also good in place of tortilla strips or fried wonton strips. Eating salad at home is much more interesting. I may add marinated mushrooms or artichoke hearts, sliced pickled beets, hardboiled egg, tomatoes, etc. You probably have your own favorites but watch the calories. For that reason, I rarely add cheese. * Grab a jar of lettuce from the fridge. * Choose a salad dressing (already packaged in individual container). 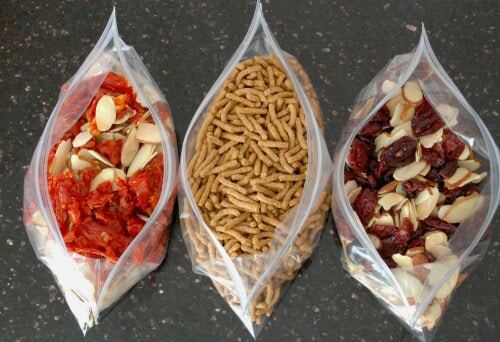 * Keep Fiber One (or substitute) and bags of almonds/dried fruit/vegetables at your work or in the pantry ready to go. Now you can have a healthy salad with no preparation in the morning if you have done your homework (less than 30 minutes with practice) beforehand. Which Vacuum-Pack Machine Should I Buy to Make Salad in a Jar? Can I Add Other Foods to My Vacuum-Packed Jar of Lettuce? I love this site! 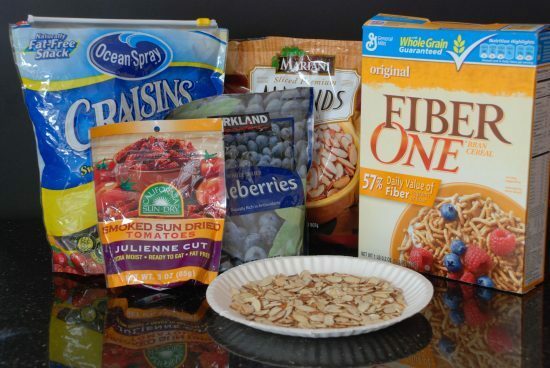 One question…I see you suggest a third cup of the fiber one, but i didn’t see how much of the other bagged goodies you suggest to put on the salad with it. I’m trying hard to lose quite a bit of weight so calories count. do you measure out a specific amount for each baggy? Thanks!!!!! Paula, I am new to your your website, but have enjoyed learning about the Salad in a Jar. Thank you for taking the time to enlighten us with this. So many people have asked the same question about adding vegetables . . you have patience, lol. Anyway, I have to admit that was my concern, too. I liked that you had only lettuce in the jar to increase produce life, but I also felt a need for other vegetables. I think I’ll try Kristy’s suggestion and pack them separately in a cup size mason jar. Again, thank you for making my life easier. This is SO NEAT! I like the dressing-to-go containers! http://www.amazon.com/Evriholder-Dressing-Salad-Container-2-ounce/dp/B0076PNQNU They are much more secure than the little plastic throwaway cups. I have been introduced to this product but did not find it useful for my purposes and I agree with you. It’s a bit expensive. To begin with, you can use small plastic containers inside a quart jar if you want-I happened to have some that fit perfectly. Furthermore, I want to fill the entire jar with lettuce so there is no room for anything else. I just add them as I go. Thanks for writing. I love your idea and prefer Romaine lettuce so it works great for me! I see that you get asked about adding the other salad veggies into the jars quite often so I thought I would share a trick I learned by accident years ago. Everyone else in my family prefers a simple salad, but I have always loved great variety in the “fixin’s” for mine so I had to get creative. I made one basic salad of carrots, red or green cabbage and Romaine and then made up a bowl of the extras for me (tomatoes, cucumbers, onions, bell peppers, raw garlic, radishes, celery, mushrooms, etc.) Obviously, my extras would not last as long as the basic salad until I realized that I could “quick pickle” it in the fridge and it lasts much longer with very little change to the texture. Just chop all those veggies, add in ACV, balsamic or rice vinegar, EVOO and salt. You can add a touch of sweetener, spices or herbs, dijon mustard, etc. to the mix and it will keep fresh for many days. Tomatoes even work because the acidity of the juice will contribute to the pickling, but it won’t last as long with them included…..my solution is cherry tomatoes. Now, the trick is to mix up a batch of this and then package it into the 1/2 pint wide mouth mason jars and vacuum seal them as well. You won’t need as much dressing for the salad (quite possible you won’t need any extra) because you are using a basic homemade vinaigrette for the pickling. The only problem that I can’t seem to solve is how to have fresh mushrooms on my salad without washing and slicing them that day so I use canned mushrooms in my extras – you can also include things like artichoke hearts or pickled peppers or beets. Also, another handy tip is to keep Mrs. Dash or Bragg’s spice mixes in your desk along with sunflower seeds, gamasio, dulse flakes, red pepper flakes or whatever other toppings you like. I have used the disposable containers to package shredded cheese and cooked, diced meat or boiled egg, beans or lentils so I can grab those along with my lettuce in the morning as well. Obviously I prefer paleo for losing weight rather than calorie and fat counting, but it would work for any style.) I also make lacto-fermented veggie relishes (pickling method that uses salt brine like traditional sauerkraut) that I use in place of my extras when crunched for time or in addition to my extras just because I love pickles. One more tip for those who love grains like brown rice and quinoa in their salads: cook a big batch, portion it out in snack baggies, flatten the baggie, seal it and freeze. These flat little envelopes take up almost no room in the freezer, thaw quickly, and are the perfect portion for adding to a lunch salad. Pre-cooking large batches of beans or lentils and freezing the same way will allow you to take them directly from the freezer into your lunch bag where they will thaw by lunch time. This is my preferred method for beans, although I do sometimes make a bean salad and portion it out in disposable containers as a salad topping. Wow Kristy–so many good ideas here. Can’t wait to try them. Thanks so much for taking the time to write and share. Kristy, thank you so much for your ideas about including other vegetables. I liked Paula’s method of preparing lettuce to make it last awhile, as it makes so much sense and I plan on doing that. But, I also wanted other vegetables in my salad. Bringing along a small cup size of ‘pickled’ vegetables and a small container of condiments will round it out perfectly. Hi Paula: Can you please tell me about how many calories you add on to your lettuce jars (including fixings and dressing?). Thanks so much. Blessings! Steph. That is a very good question so I sat down and figured it up. My lunch salad will normally include 2 quarts of chopped Romaine, 2-4 tablespoons salad dressing (calorie count can vary with variety but this is where I spend the most calories), a mixture of seeds and dried fruit (a handful–about 1/4 cup), about 1/4 cup Fiber One cereal for serious crunch, and a foil package of water-packed tuna or salmon. The calorie count figures to be somewhere between 300-350. I don’t need or eat anything else for lunch unless I have a small tidbit of a leftover from dinner the day before. If so, I leave off the fish. I do sometimes add other things instead of the seeds and fruit, like a tomato; or a hardboiled egg instead of the tuna. But I don’t stray far. Hope this helps. Haha! Yes, I figured that you really were not a rabbit. 🙂 I have one more question if you do not find it too intrusive…would you be able to give an approximate breakdown of the calories per day (just roughly) and how you spend them? I think I read that you are eating greek yogurt about twice a day? I am asking because I think part of your success with weight management is eating many of the same things day in and day out, albeit with creativity. I am trying to give myself a plan that is doable, fills me up (I don’t do well starving, but at 51 I cannot eat many calories without gaining) and that works easily for work. Sorry for all the questions and thanks for this wonderful website! 🙂 Steph. You are very perceptive. I will write down a quick plan for you and send it to your personal email. I’m actually thrilled and honored that you asked. Be watching for it sometime in the next day or two. You are extremely kind! I got the fiber one and I actually really like it in salad! Looking forward to hearing from you! XO, Steph. Thank you so much for all your information and help! I am so excited to get the food saver to help me lose weight! I am so excited over this Salad in a Jar.. I purchased everything I need yesterday to get started BUT the ONE item I can not find is the ZIPLOCK HAND PUMP. I have been to WalMart, Kroger and Publix.. I just saw where you noted the aisle it should be on.. Will give it another look.. I was so sad after doing all the prep work an that the other hand pump I had did not so the trick.. If you can’t find it, you can always order online here. I love your site, and your salad in a jar idea. That said, I found an even easier way for me. I wash my lettuce, and I love the artisan mix of 4 small heads of various kinds, that are available at aldi’s or walmart, as well as other stores I am sure. I wash with a vegi wash and drain very well. I then tear the lettuce by hand, takes me maybe 10 minutes for all of it. I put 3 paper towels in the bottom of a big rubber made 5 qt container, and another 3 on top. If the paper looks very wet I pull it out and replace it. That is it, luckily we have full size friges at work, so I can place this in the fridge, and it will last all week. I make it on Sunday and the lettuce is still crisp on Friday! not sure why, but the paper towel to absorb any moisture seems to prevent the slimy nastiness lettuce normally gets after a few days. Thanks for writing. I think you have found a good method for you–especially if you like the artisan lettuce. One of the best things about that lettuce is the packaging as it tends to keep the lettuce fresher for longer because the entire head is still intact. Furthermore, vacuum-packing is NOT good for the more delicate types of lettuce, e.g. an artisan mix, Bibb lettuce or spinach. It will go slimy rather quickly. For those of us who prefer the sturdier lettuces such as romaine and raddichio, vacuum-packing is a godsend. But I will mention your method to people who ask about preserving artisan lettuce. Beth Sherrill’s method above is almost how I do it, except it’s usually romaine lettuce (though it works fine with Boston lettuce, red lettuce, etc). It definitely lasts a good week, often longer (though a few days after that I’m starting to pick out a couple brown pieces each time I go in to the bag. Anyway, my method is … slice up my lettuce. Clean and rinse it. Then, I fill the crisper (or very large stainless bowl like you have, Paula) with VERY cold water. Let the lettuce sit in the water for about 15 minutes or so (shorter if I just bought it, but I tend to let it sit in fridge a few days before I get around to chopping it up). It REALLY crisps up the lettuce! Then I give it quite a few good spins in the spinner. I really try to get the water off since there’s plenty inside the lettuce itself now. I’ll even dry it with paper towels a bit. Then I put a paper towel in the bottom of a ziplock bag, insert my lettuce (whatever fit into the crisper), then put a paper towel on top. Get rid of as much air as I can. Then quickly get it into the fridge. The key is to keep it chilled from the point of soaking it in the water to getting it into the fridge. If need be, replace your towels (if they get wet, etc). Even with going into a bag a couple times, the lettuce stays fresh for me for at least a week. I do keep my fridge very cold (about 33-34 degrees) which may help. I’ve greatly enjoyed reading all your posts about yogurt and salads (and watched all your videos). I’m moving on to your recipe page next. Wish you would continue updating your blog, and do more videos – I think you do a very good job…even if you do speak very quickly (said from one fast speaker to another!). I just want to know if it really stays fresh after 5 days in a jar. Whenever I cut lettuce, I lasts for a day, but when I do not cut it and use it daily bases, I can use lettuce longer. Your question made me smile. The answer is yes!!! Vacuum-packing chopped lettuce keeps it fresh for a good week, sometimes more. If you were my neighbor, I would show you and give you a week-old jar. You would be amazed. As it is, I guess you will just have to try it. Have you seen this post about how to try it out cheaply? What an interesting concept! A friend introduced me to your YouTube video and I am intrigued! I am curious to know…can you add chopped veggies and/or fruit to the salad you put in the jars? For example, I like to chop Roma tomatoes, Gala apples, carrots, cucumbers and green onions (along with blueberries or strawberries) for my salads, so they’re flavorful and filling. Would these items keep as well as the lettuce if added to the jars before sealing? This post is my answer to your question. Remember that this vacuum-packed lettuce is a different concept from the layered salads you see on the web which are not normally vacuum-packed. Thanks for the tip Stephanie. I have tried them before but will try the honey mustard, specifically on your recommendation. 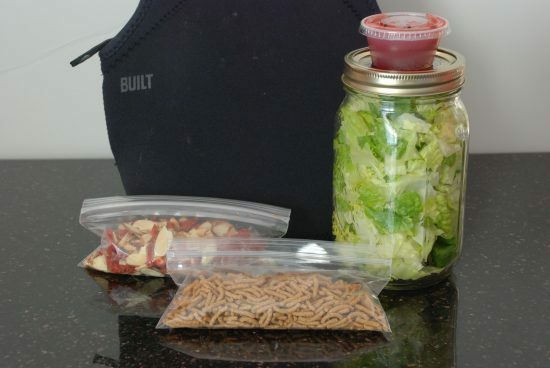 Could you use baby food jars for dressing with the ziplock tool and electric tape? I haven’t tried it but think it would probably work. Wouldn’t cost much to try it. Great idea. Just watched your video on how to vacuum the salad in the jar. Amazing! I am a Weight Watchers leader and our topic this month is eating more fruits and veggies. At our meeting today, we talked about how to preserve our produce so it lasts longer. I can’t wait to share this with our members! I’m buying a Foodsaver today! Thanks! Great to hear from you. You might want to read these two posts for alternate methods of vacuum-packing for those in your group who can’t afford a FoodSaver. in my area and I think this would be great to do this along with my other jar creations. Your reply would be greatly appreciated. I do not recommend vacuum-packing salads with additional ingredients because it shortens the amount of time you can store the salad. If you don’t care about that and plan to eat them within a day or two anyway, maybe it doesn’t matter. I guess I’m just saying it doesn’t fit with my whole purpose for doing salad in a jar. You can read more about my thoughts and experience with this subject here. I am envious of the green markets you have available to you. Nothing much like that in my area and I miss them. Thanks for writing. I made salad in a jar for the first time the week of July 4th. Today is July 30th, and I found one in the back of the fridge – STILL CRISPY AND FRESH!!!!! I poured it into a bowl and went through it – not one brown piece! WOW!!!!!!!!!!!!!!!!!! I’m not surprised there were no brown pieces but it doesn’t usually stay fresh tasting that long. In my experience, a week is about the limit. Sometimes 8-9 days if the lettuce was extremely fresh when you started. I am so excited to find this. I have a Foodsaver and have never used the jar attachment. I’m going to go find it and get lunch ready for the week! You are in luck. Hope you enjoy your salad greens ready and waiting for you with the pop of a lid. Thanks Paula! I just read your post about the hand held sealer! I’ll have to look into that! Have you read my post about using a hand held sealer? It’s a much cheaper way to go. In a few weeks I’m going to post about another way to seal your jars for pennies. Check back. Hi, great blog! Salad in a jar sounds great, I grow lettuce and would love to keep it cut and ready to eat. You seem well in control of your weight, I need to lose 30-40lbs. What is your daily eating and exercise regimen. Do you eat basically the same thing every day? Thank You! I’m so excited. I pinned your blog a few months ago and have been intrigued by your salad in a jar concept ever since. We have a hand-me-down food sealer that, I think, is older than me so I doubted it would be compatible with a jar sealer. Well, QVC had a super duper model on sale and a relative ordered me one! Now I just have to get the attachment and I see lots of salad in my future. Thanks SO much. You’ll enjoy how convenient it is to grab a jar of salad every day once you have them prepared. Terri, I am DYING to know how your Cheddars turned out! I am a wannabe cheesemaker. Also, I am trying the salad in a jar starting this week. I LOVE this idea! I can’t wait to try it. I think I may add some shredded carrots to the lettuce. If I want to add tomato or cucumber, I can do that when I prepare it. I make my own Bacon/Tomato dressing, so it saves a ton of money. Thanks so much! I actually learned this when I watched your video on Home-Made Greek yogurt since I make my own Cheddar Cheese. Thanks Bunches!! Finally–a woman like me! So glad you took the time to write. Your bacon-tomato dressing sounds fabulous. love the idea of lettuce in a jar I am going to watch your website more often keep on cooking. Love the idea. Why not use your empty spice bottles for the salad dressing. Thank you SO much for this idea- I HATE packing lunches and have recently made a decision to pack our lunches for the week in one Sunday (before). We are also watching our calories- I’m eating 1200 calories most days (not all-no one is perfect) but my husband can eat 1000 calories more than I can each day (he’s 6’4″ and a big guy). This helps me stay low cal- I had already been eating salad most days anyway, but hated “packing” them. Now I can accomplish all goals without much complaining. Yes, I have tried it but your salads won’t last near as long, depending on the vegetables you choose. Cucumbers, spinach and tomatoes are especially short-lived. I like my lettuce to last at least 8-9 days so I add whatever I want when I eat it. Since the salad is already cleaned and cut, it doesn’t take long to slice up a couple vegetables. You can read more about the subject here. Hope you enjoy your previously prepared but super fresh salad. I love the idea of salad in a jar. Although I am a stay-at-home, it would be great to encourage me to eat more veggies and keep the lettuce fresher longer (my dh HATES seeing me compost so much veggies that don’t get eaten as quickly as possible). I, personally, do not eat prepackaged cereal since so many of them have some ingredient or another I prefer not to consume. However, either wheat germ or ground flax seed would make great fiber fill in. If you’re looking for more crunch, nuts work great for me, especially sliced almonds. Really enjoyed reading your blog. I was also wondering if you have tried adding other vegetables into the jar with the lettuce? Lori, I wrote about your question on a recent blog post you can see here. For salad dressings, diced olives, honey, etc., I use the small zip lock bags that can be purchased at most hobby stores for jewelry, etc. I squeeze out what I want and toss the rest back in my lunch bag for another day. I generally have one of the frozen lunch packs in my bag (no fridge close to me at work), so they stay cool till I get home. I pack 3-4 of each condiment on the weekends and grab what I want each day. Great ideas Mary. Thanks for sharing. I had forgotten about those frozen lunch packs but they are ideal for lots of situations i.e. sitting with relatives or friends in the hospital, long shopping trips, etc. Happy New Year! I love the whole idea of salad in a jar. We have used our original Food Saver for nearly 20 years now and it gets used śeveral times a day. Salad is another to add to my list of great uses. I have a question though. Fiber One cereal contains aspartame ( Equal) and I get migraines from it along with a persistent metallic taste so Fiber One is out. Any other cereals out there which you have tried on salad and which don’t have Aspartame? Even many of the other bran cereals such as bran buds have Aspartame. Wish they would take it out of foods. Thanks in advance for ideas. WOW!!! I LOVE YOUR BLOG!!! Just came across a photo of how to make salad in a jar at Pinterest! GENIUS!!! and I’m browsing through your blog now. Good Stuff!!! I was just wondering if you can add tomatos, onions etc to the jar before using vacuum? I think you must mean 2-3 TBL of dressing, not 2-3 ounces? Elle, Actually, I do mean 2-3 ounces. The little plastic containers hold 2 ounces which is 4 tablespoons of dressing. As I write this, I’m realizing that sounds like a lot but it doesn’t really seem like much because I pack the lettuce in the jars as tight as I can. The lettuce almost fills a 2-quart container when you pour it in a bowl so I need more than the usual “serving” suggested on the bottle. Thanks for dropping by. And thanks for giving me a chance to make this a bit clearer. Can anyone tell me what Foodsaver model and attachment I need in order to use my mason jars for “salads-in-a-jar”? Angie, you need a model with an accessory port. That is a small round hole where the wide mouth attachment hose will connect to the machine. Many FoodSaver models have it but not all. The FoodSaver Mini Plus has it and it lists for 69$ on the FoodSaver website. Then you must order the wide mouth attachment online no matter where you buy the machine. At least I’ve never seen it anywhere else. Personally, I would buy a machine locally where you could return it easily if it doesn’t work and order the attachment online. I use my foodsaver for everything and i also have the Mason jar sealer and use it to seal rice, nuts, etc and can’t wait to use this on the lettuce. I am not a morning person and wow how wonderful to grab a jar of lettuce. thank you for the idea. Hi; quick Question for you. I love the idea of the crunchy fiber one add in, but I find it too sweet (I have a nasty “salt-tooth”); what else can you suggest along that line? I love these ideas! Another thing that I bring for salads is a small, snack size container of mandarin oranges. I love a salad with an Asian dressing, mandarin oranges, sliced almonds, and a few chow mein strips (although not the healthiest – I’m sure the fiber cereal would be a good substitute). Thanks again! I really like your salad in a bottle idea, especially since the bottles are reusable; therefore, environmentally friendly. Have you considered using the 1/2 c mason-type jars for your salad dressing rather than the disposable plastic containers? I bought a box of 12 & use them all the time, mainly for salad dressing but also for nuts, seeds, etc as they also make portion control easy – you can’t fit more then 1/2 c in the bottle!!! I also use them for freezing stuff like egg whites, rice, & refried beans in individual portions. Hi Tracey, The 1/2 cup jars sound perfect. And I agree. Great for portion control. I love salads and I really like your jar idea! But I’m concerned that you’re eating “diet” dressings and promoting them as healthy because they usually have artificial sweeteners in them and are NOT healthy at all! Hi Sarah, I hear your concern and you are certainly welcome to your opinion. We may have to agree to disagree on this one. This is my philosophy about the whole sweetener issue. I would rather have sweetener than sugar. Honey, molasses, agave and other natural sweeteners all pack calories too. Although time may prove otherwise, moderate use of sweeteners has not been proven harmful despite what some say. They help me keep my weight in check which ultimately is much healthier than being overweight. On a personal note, my mom lived on Sucaryl (yikes! )for many years and she will soon be 94. I assume you totally will disagree with me. However, I am the weight I want to be (doctor agrees) and otherwise abstain from many other unhealthy habits such as drinking, smoking, fried foods, fast foods etc. Since everybody needs at least one vice, I guess sweetener will be mine. I love the salads but have to disagree with you on the sweetener. I have lost the website.org in a computer crash so I can’t back this up. I was researching fibromyalgia after my diagnosis and stumbles onto a government report from a veterans hospital. Seems that the normal stats for fibro is something like 1 out of a hundred people get it and 6 out of 10 of those are women. (Don’t quote me on the stats, I’m working from memory here.) But in vetrans returning from the Gulf, it was more like 30 out of a hundred and nearly 50/50 male and female. In studying this phenominon, the only commonality they could find was the diet soda donated by the American cola companies. As it turns out, Aspertain is harmless as long as it is below 86 degrees. Above that temp and there is a molecular change and it is poisenous. It settles into joints and ligaments. and builds up over time. The higher the heat the more poison. Trust me as a former truck driver, all diet soda spends time over 86 degrees, in warehouses, trailers, etc. I quit drinking my daily diet soda and miracle of miracles, I do not have fibromyalgia after all. It took about 10 days to be completely pain and medication free. Don’t be fooled into damaging your joints for 9-18 calories. Ya know even Dr Oz didn’t want to come out against diet sweetners, instead he pretty much said the same thing, healthy options are better. Honey, agave and yes even can sugar for the few calories extra. Aspertain has been linked to memory loss and other illnesses too. Alzheimers and dementia. Definitely something to think about. Wow, Paula, this is GREAT! I’m so glad I found your website and this wonderful idea for “salad in a jar”! I didn’t know that lettuce would keep so well in a glass jar, but am definitely going to give it a try. And love all your dressings and toppings. We’re BIG salad people here so this is really fun. Thanks! Have you tried adding the other veggies in before vaccuum sealing the jar? I was thinking to put the whole salad together like carrots, celery, tomatoes, and what ever else you like. I have a food saver and was just about to order the attachment but the shipping of $9 slowed me down. If I could make the whole salad, I may just go for it. Thanks and looking forward to your response. So good to find you still doing what you love. I am definitely a fan! Debby, So good to hear from you. How did you find my blog? Hope all is well. The smoked sundried tomatoes and Fiber One are my favorite new toppings. What a great taste. Keep these good tips coming. Is the Honey Mustard a mix or already prepared? Since I am not a Walmart shopper, did not know if it was a mix. Have seen a Good Seasons brand but it is a mix. I agree that you can waste too much fat on the dressing. I like some of the spritz dressings but you do need space in the refrigerator. It’s called “All Seasons” and is prepared–sold in a bottle. Try balsamic vinegars. They do not need refrigeration.